Pilot Pens Sweepstakes: Win a FREE Carnival Cruise! What Monday is complete without an idle fantasy or two about taking a luxury vacation? Now you have a chance to make the dream a reality — thanks to Pilot Pens! 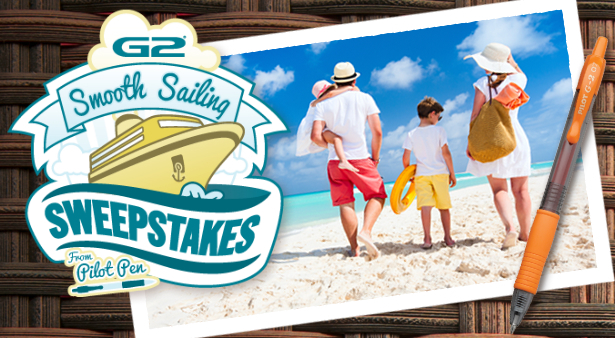 Enter the G2 Smooth Sailing Sweepstakes by June 30th for your chance to win a $10,000 Carnival Cruise from Pilot Pens. Best of all, you don’t have to buy anything to enter the sweepstakes! Just mail in the sweepstakes entry form or enter online at PowerToThePen.com/sweepstakes. Don’t miss your chance to win the ultimate dream vacation! Enter the Pilot G2 Smooth Sailing Sweepstakes today for your chance to win! What a terrific prize this would be! I think I could be a gracious winner.